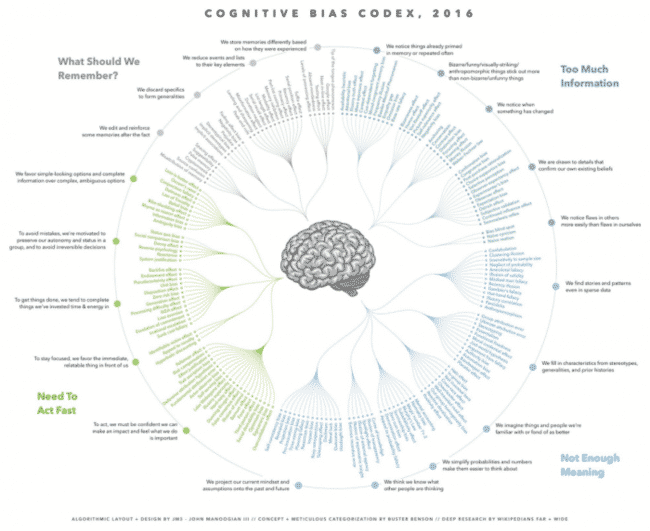 This is easily the best visualization of cognitive biases I’ve ever seen, and it’s on the best page of cognitive bias descriptions I’ve ever read. What I like most about this page is that it breaks them into categories, and that those categories are then represented visually in the image. I love how they give their own description but then link to all the various Wikipedia entries for the related topics as well. I have captured and linked to them here because I want to find them through my site and I don’t want anything to happen to them where they are now (which doesn’t look terribly permanent).